Chris Williams is a Partner and Co-Chair of Calfee’s Litigation Department since 2011. He regularly represents clients in corporate and commercial business litigation matters, including ERISA disputes. As lead counsel, Chris has prevailed in multi-million dollar jury and bench trials in Ohio and across the country. 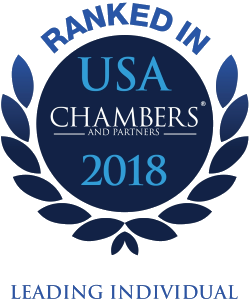 Chris is recognized as one of “America’s Leading Lawyers” by Chambers USA 2018 for Litigation: General Commercial. Chambers researchers reported in 2018: "Christopher Williams offers considerable experience in commercial disputes, representing clients in litigation across the country. He offers particular strengths in healthcare and ERISA claims." Since 2013, Chris has been selected for inclusion in The Best Lawyers in America© in the areas of Commercial Litigation and Litigation – ERISA. For the years 2016 and 2018, Chris was recognized by Best Lawyers as its Cleveland ERISA Litigation “Lawyer of The Year,” a distinction reserved for one lawyer per practice area each year. Chris also has been recognized by Benchmark Litigation as an Ohio “Litigation Star” in the areas of Competition, General Commercial, Health Care, Professional Liability, and Securities from 2012-2019. Based on statewide voting by Ohio lawyers, Chris was recognized by Ohio Super Lawyers as a Top 100 Attorney in Ohio in 2013 and from 2015-2019, and as a Top 50 Attorney in Cleveland in 2013 and from 2015-2018. Chris is also a Life Member of the Judicial Conference of the 8th Judicial District (Cuyahoga County). Chris currently serves on the Board of Directors of the Columbus-based Ohio State Legal Services Association and College Now of Greater Cleveland. In addition to Co-Chairing the Litigation Department, Chris serves on Calfee’s Practice, Planning & Growth Committee (formerly known as the Executive Committee), Diversity & Inclusion Committee, and as Chair of the firm’s Pro Bono Committee. Represents Ohio’s largest health care insurer in connection with multi-million-dollar real estate disputes arising from failed sale-leaseback transactions. In 2016 represented one of Ohio’s largest steel companies in a multi-million-dollar three-week jury trial arising from a $100 million construction project gone awry. In 2014, defended a publicly held Ohio bank against federal court allegations of lending and collections fraud and negotiated a nuisance value settlement of plaintiff’s claims. In 2012, presented oral argument to the 11th Circuit Court of Appeals in Atlanta and obtained final judgment affirming the district court’s order dismissing the adverse parties’ myriad federal claims arising from alleged fraud, RICO and conspiracy activities relating to failed Florida real estate investments. Successfully established a lack of personal jurisdiction in Ohio and obtained a final judgment in 2012 from the U.S. District Court for the Northern District of Ohio for a large North American parking management company in a dispute with a competitor arising from their joint venture at the Toronto Pearson International Airport. In 2011, summary judgment was awarded to Calfee’s publicly held client in a case alleging alter ego and corporate veil theories against the client arising from a failed Cleveland real estate venture. In 2010, represented a publicly owned Ohio bank in a class-action lawsuit arising from alleged false and fraudulent mass mailing advertisements; the case was dismissed with prejudice by the court with the granting of Calfee’s motion to dismiss. In 2017 represented a publicly held Cleveland company in connection with multi-million-dollar claims against it arising from golden parachute/change-in-control agreements entered into with former company executives. Final judgment in favor of Calfee’s client was entered by the trial court, was affirmed by the Cuyahoga County Court of Appeals, and the losing plaintiffs unsuccessfully sought Ohio Supreme Court review of their claims. In 2016, defended Ohio’s largest health care insurance company in separate, multi-million-dollar billing fraud lawsuits, one of which resulted in a final judgment disposing entirely of the plaintiffs’ $22 million causes of action, and the other of which resulted in a negotiated zero cost dismissal. In 2012, appeared for a preliminary injunction hearing in Newark, NJ federal court, the hometown of the opposing party, one of the world’s 10 largest insurers, and defeated the insurer’s request for an order prohibiting Calfee’s client from assigning to a third-party a multi-million-dollar administrative services agreement. "2018-2019 ERISA Litigation Update," Worldwide Employee Benefits Network Northeast Ohio Chapter Annual Legal & Regulatory Update, Cleveland, Ohio, March 7, 2019. “A Day in the Life of In-House Counsel," Association of Corporate Counsel Panel Discussion, Cleveland, Ohio, November 13, 2018. "The Art and Science of Jury Selection and the Parallels to Be Drawn From the Recent and Unprecedented Anti-Establishment Presidential Campaign,” Calfee, Halter & Griswold and KPMG’s 17th Annual Litigation Seminar, Cleveland, Ohio, September, 2016. “Effective Voir Dire - Using Jury Selection to Increase Your Success at Trial,” Ohio State Bar Association, Cleveland, Ohio, September, 2015. "Depositions of Corporate Representatives: Best Practices to Maximize Opportunities and Minimize Risk,” Panelist, Calfee, Halter & Griswold and KPMG’s 16th Annual Litigation Seminar, Cleveland, Ohio, September, 2015. "Resolving Discovery Disputes: Let’s Eliminate the Motion to Compel,” Panelist, The Twenty-First Judicial Conference of the Eighth Judicial District, May, 2015. "WEB Annual Legal & Regulatory Update - ERISA Litigation 2014-2015," Cleveland Chapter of the Worldwide Benefits Network (WEB), Cleveland, Ohio, March, 2015. “Effective Voir Dire - Using Jury Selection to Increase Your Success at Trial,” Ohio State Bar Association, Cleveland, Ohio, October, 2014. “Effective Voir Dire,” Ohio State Bar Association, Cleveland, Ohio, October, 2013. “Lessons From and For In-House Counsel During Investigations and Litigation,” Calfee's 14th Annual Complex Litigation Seminar, Cleveland, Ohio, August, 2013. “Federal Circuit Courts of Appeal Continue to Circumscribe the Instances in Which ERISA Plan Administrators May Rely on an Internal Plan Statute of Limitations,” Co-author, Calfee First Alert, September, 2015. “Sixth Circuit Clarifies When the Terms of an ERISA Summary Plan Description are Binding,” Co-author, Calfee First Alert, August, 2015. “Third Circuit Expands the Scenarios Under Which ERISA Parties May Recover Attorney’s Fees,” Co-author, Calfee First Alert, May, 2015. "U.S. Supreme Court Rejects “Presumption of Prudence” But Sets High Bar for Plaintiffs to Survive Motions to Dismiss ERISA Stock-Drop Suits,” Co-author, Calfee First Alert, June, 2014. “The U.S. Supreme Court’s Reverence for Unambiguous ERISA Plan Terms Returns to Plan Administrators Some Needed Control Over ERISA Benefits Lawsuits,” Co-author, Calfee First Alert, June, 2014. “States face battle when adding requirements for ACA counselors, navigators,” Co-author, Managed Healthcare Executive Magazine, March, 2014. Association of Corporate Counsel Panel Discussion – “A Day in the Life of In-House Counsel"
"Christopher Williams offers considerable experience in commercial disputes, representing clients in litigation across the country. He offers particular strengths in healthcare and ERISA claims."